We’re willing to bet a small fortune that many people reading this first line can’t say they’re not slouched at their work desks right now. Don’t believe us? Take a second to evaluate your body. Your current posture may feel cozy right now, but it may also be the cause of those slight kinks in your neck and back due to long hours spent behind a desk. Improper posture at work can actually lead to musculoskeletal disorders or MSDs. According to US Department of Labor, work-related MSDs occur when “the physical capabilities of the worker do not match the physical requirements of the job.” MSD risk factors stem from both awkward and static postures and can affect various parts of the body including the arms, hands, fingers, shoulders, back and legs. Here are some simple workstation adjustments which can prevent MSDs and promote work productivity. We are often told to “sit up straight” or “sit with good posture”. When you read those words you probably automatically think sitting with your chest lifted, shoulders back, chin up, ready to join the next wave of volunteers for the U.S. Marine Corps. Yes, the Marines have perfect posture, but it doesn’t feel practical for every body, all day long. In fact, most people try that, and are right back to their usual slouchy posture within 5 minutes. So, what is correct yet practical posture for working at a desk? Great posture is all about protecting the natural curves in your spine. It’s most important to maintain a concave (inward) curve in your lumbar spine - your low back. To do this, sit all the way back in your chair until your low back feels supported. If your chair has lumbar support (a rounding out or extra cushion space in the low back region), then you want to be pressed right up against it. If you don’t have low back support in your chair, you can roll up a small towel, light sweater or sweatshirt. Place that roll right against the curve in the small of your back. This will keep you upright with ease. Next, squeeze your shoulder blades together briefly and then relax. That position is a good idea to return to in order to keep your shoulders from rounding. Lastly, if you’re still feeling slouchy try to remember this cue: lift your breastbone up in the air by about 1 inch. This keeps you upright without feeling so restricted that you can’t maintain it! 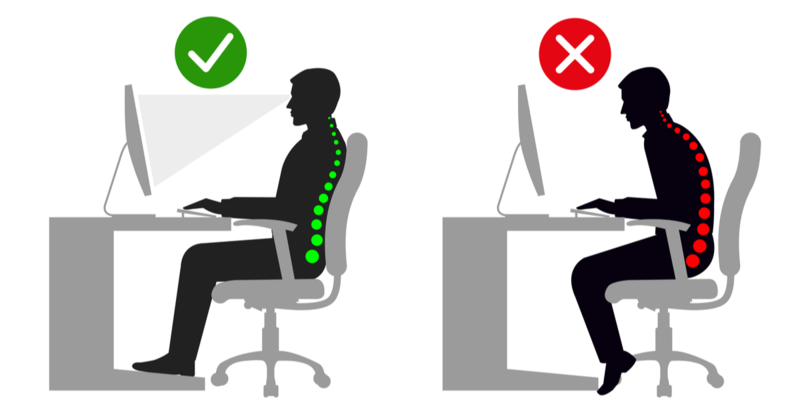 These simple tips will give you excellent desk posture. You’ve got your natural posture down. Now it’s time to adjust your chair. Keep in mind that all that time spent finding your natural posture will have been for nothing if you don’t adjust your chair properly. This is often a challenge for employees wanting a better workstation because chairs come with too many functions. This is why taking the time to learn how to properly adjust your chair is important. Most chairs were actually built with ergonomics in mind, so it shouldn’t be too much of a challenge. We suggest lowering your chair until your thighs are parallel to the floor, with your feet flat on the floor (or a footrest). Your goal should be to have your seat pan at a 2-inch space between the back of your knees. The backrest of the chair should also be unlocked to promote movement of your upper body. If your work involves computer use, it’s best to arrange them based on distance and height. Finding the perfect distance is as easy as sitting back and extending your arm to where the tips of your middle finger touch the screen. This method is a great way to prevent craning of the neck. To find the perfect height, try closing your eyes. You should be able to see the address bar when you open your eyes. If you don’t see the address bar, raise your monitor and try this method again. Depending on the height adjustment functionalities of your computer monitor, you may have to use books or other height adjustment methods. Proper desk ergonomics involve making sure that there’s enough space for your feet, knees, and thighs. 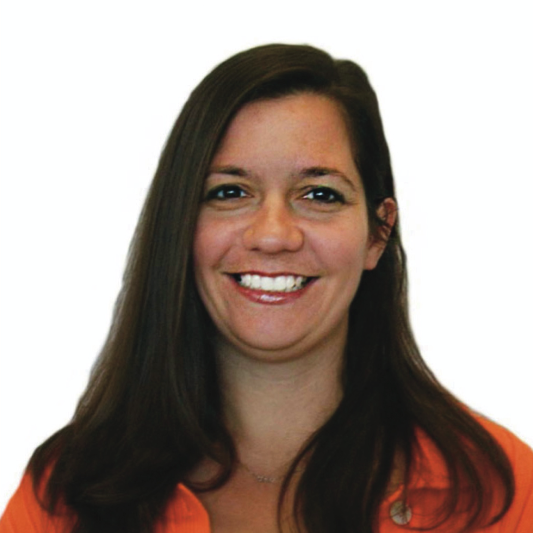 Although this isn’t something most employees experience, if a desk is too low and is not adjustable, consider placing boards or blocks under the desk legs. If the desk is too high, consider raising your chair without compromising your natural posture. Also, don’t be afraid to use a footrest to support your feet. If your desk has one of those hard edges, get a wrist rest. Lastly, Do not store anything underneath your desk. A comfortable, ergonomic workspace can help you feel and work at your best. We suggest keeping these tips in mind every time you start the work day!